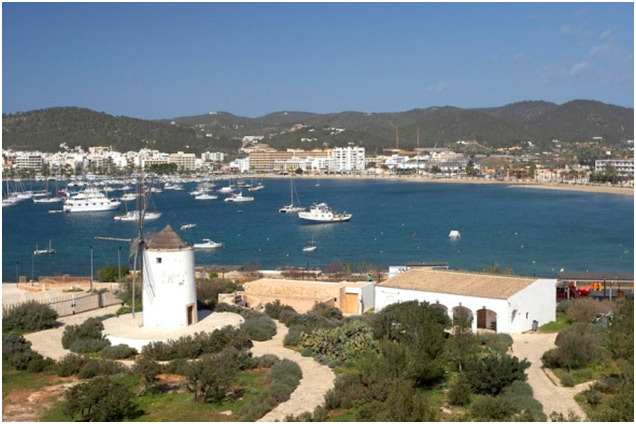 Located in the bay of Sant Antoni, for Sa Punta des Molí it seems that time has not passed. In this place steeped in history, are collected the unmistakable mill, the wheel, the house and the boathouses, which form one of the most emblematic images of Sant Antoni’s skyline. In the past, because of the activity of the mill, this area enjoyed great importance. Although this activity stopped a long time ago, it has lost neither charm nor importance and is currently used as a Culture Space, which can be visited. If you want to know more about this magical corner of Sant Antoni, in the following link you will find a guide of Sa Punta des Molí.